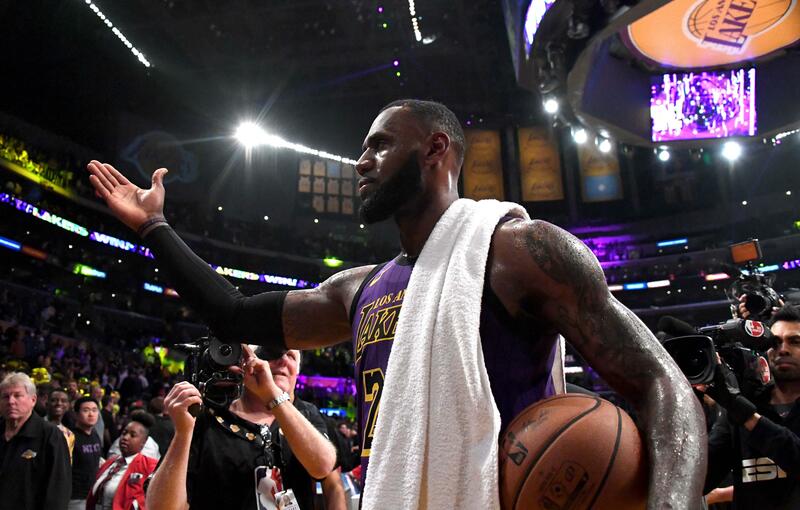 LOS ANGELES -- LeBron James had a season-high 44 points, 10 rebounds and nine assists, passing Wilt Chamberlain for fifth place on the NBA's career scoring list and leading the Los Angeles Lakers to a 126-117 victory over the Portland Trail Blazers Wednesday night. The 33-year-old superstar scored 28 points in the second half and vaulted past Chamberlain on a three-point play with 3:55 to go, finishing the night with 31,425 points, six more than Chamberlain amassed in his iconic career. Kareem Abdul-Jabbar is the NBA's all-time scoring leader, with 38,387 points. Next ahead of James on the list is Michael Jordan, with 32,292. James fell just short of the 75th triple-double of his career during his most impressive performance since joining the Lakers in the offseason, finishing with what CBSSports.com's Jack Maloney called "a monster stat line of 44 points, 10 rebounds, nine assists and three blocks." James has moved from seventh to fifth on the career scoring list during his debut season with Los Angeles, passing Dirk Nowitzki and Chamberlain. Five of the top six scorers in NBA history suited up for the Lakers, and James reached his latest milestone during a dominant performance that had chants of "M-V-P!" raining down from the Staples Center crowd. Before the Lakers embarked on a three-game trip including his return to Cleveland on Nov. 21, James showed his new home fans what they can expect in big games, as if they didn't already know. James scored 16 points in the third quarter and 12 in the fourth, never allowing Portland to make a final run during the Lakers' fourth consecutive win. Damian Lillard had 31 points, 11 assists and eight rebounds, and CJ McCollum scored 23 points in the Trail Blazers' first road loss to the Lakers since Feb. 22, 2013, ending a nine-game streak at Staples. Portland has lost two straight to the Lakers after winning 16 in a row. JaVale McGee scored 20 points and Brandon Ingram added 17 in the Lakers' sixth win in seven games. After a slow start, Los Angeles (8-6) is already finding its groove in its first season with James and his fellow veterans joining the young core. Portland hit nine 3-pointers in the first half and led by 13 midway through the second quarter, but James led a 27-10 run to a 59-55 halftime lead. James punctuated one of the most assertive stretches of his season with two long 3-pointers in the final 25 seconds, finishing the half with 16 points. James hit his fifth 3 without a miss in the third quarter before Al-Farouq Aminu ended his perfect night from distance with a block.